The resistance-coupled charging electrode ALW was created for use with the charging generator AGW. 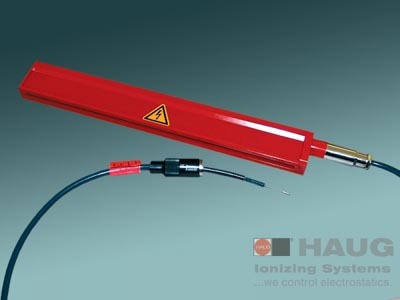 By limiting the current using resistors, the generation of hard sparks can be reliably prevented, thus significantly reducing possible damage to or impairment of electronic machine controls. The charging electrode is connected with a detachable, shielded high-voltage cable and can be supplied with a radial or axial HV-connection. The bar profile is manufactured from glass fibre reincforced plastic which is also suitable for use at higher temperatures. A T-groove along the back of the ALW alllows convenient installation over the whole width of the bar. The resistance-coupled charging electrode ALW is recommended, in particular, for applications with increased risk of spark generation and consequently of damage to high-grade surfaces of electronic components. Conceivable scenarios include situations where the counter-electrode required for charging is not always covered completely by the material to be charged, e.g. where two-dimensional material webs of varying width are charged or where there is an uncovered gap between cut or individual materials on the substrate acting as counter electrode.